Month of Challenges 7! Will you accept the challenge?? Discussion in 'Announcement Pad' started by lmccandless, Nov 21, 2018. Also, remember that our Black Friday and Cyber Monday SALES are a great way to stock up before MOC!! Here's an update for your siggy!!! susan1245, paula kesselring, Psychozoe and 18 others like this. the Toucanettes and I have registered. Justagirl, scarletsierra, MrsPeel and 2 others like this. 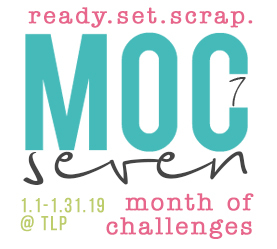 I can not believe it is the 7th year of MOC. Seems like only yesterday that first one was debuting. Looking forward to all the fun! MrsPeel, Karen and lmccandless like this. violaine, MrsPeel, Karen and 1 other person like this. AJK, MrsPeel, Karen and 1 other person like this. MrsPeel, Karen, Carol K. and 1 other person like this. I'm SO looking forward to this next MOC!! I registered! Justagirl, AJK, MrsPeel and 1 other person like this. MrsPeel and Karen like this. Woot woot I love MOC.. I cannot wait.. this will be my 7th year and I will complete it all again Happy Happy!!!! KarenB and MrsPeel like this. I am registered and excited! Last night I saw my journal entry in which I wrote about registering for the last MOC. I wrote that I had been ambivalent about which to select to indicate how often I do MOC. I have only done the last three so "every year" sounded inaccurate. So I clicked on "Yes, I've participated in a previous MOC" but that sounded inadequate for having done 3. So I decided today to choose "every year." I've done it 3 years in a row now and anticipate doing it every year for many more years! Any other Steven Universe fans like my family? trekmom, Justagirl, KarenB and 4 others like this. Monica Moriak, MrsPeel and cfile like this. Monica Moriak, cinna, MrsPeel and 1 other person like this. I updated my siggy and even made the MOC image linked to this thread. I've been planning on putting my all time favorite siggy up after Thanksgiving though, so I'll have to update again in a couple of days. I'll figure out how to make it all fit. wow!! it's almost MOC time!! this will be my second time, hope to complete it again! Justagirl, Monica Moriak, MrsPeel and 1 other person like this. Signed up - I did not finish last year (personally some of the challenges was out of my "zone"). Hoping to finish all this year. Justagirl, MrsPeel and Karen like this.